Highlights from the BC Lions season preview conference call and three signings. Dennis Skulsky says renovated BC Place will be one of the best facilities in North America. 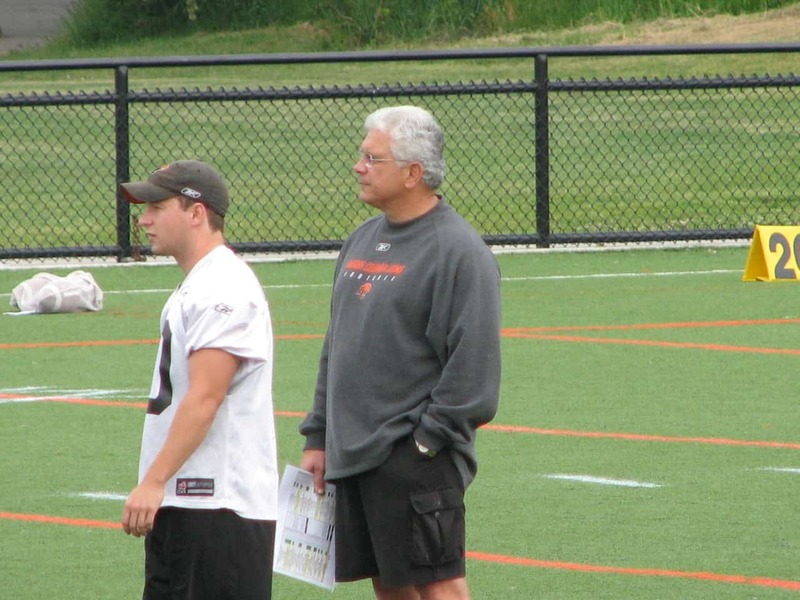 Wally Buono says that defensively, the Lions will go with a three-man front much of the upcoming season. Buono confirms that the Lions are has signed QB Matt Johnson from Bethune-Cookman University. Buono says the club may sign a 6th QB before camp…likely Cal’s Kevin Riley, who impressed at the recent Portland free-agent camp. The club will announce their new defensive line coach on June 1st. Buono on the improvement of the offensive line: ‘We have the best left tackle in the league (Archibald) & that should help us a lot’. Buono on QB Matt Johnson: ‘A lot like a young Damon Allen bc of athleticism…Danny Barrett speaks highly of him’. Buono not worried about replacing Davis /Arceneaux; cites Moore, Harris, Black, Gore, Iannuzzi as guys who can step up. Buono: ‘Elimimian reminds me of Alondra Johnson’. Buono confident that 2011 bc offensive line will be a lot stronger and the team will get more consistent play at quarterback. Buono says the team is still investigating non-import WR Kamau Peterson’s medical situation. “If we weren’t thorough in that situation we wouldn’t be doing our job”. In addition to the signing of Matt Johnson, the Lions also announced the signings of running back / kicj return candidates Michael Smith (Arkansas) and Tim Brown (Temple). Thanks to Mark Masters of the National Post for his live tweets that made this blog possible, as well as the TEAM 1040. The BC Lions held their annual off-season state of the union conference call with the media today and while we weren’t privy to the call, we were fortunate to have the Tweets of Mark Masters, writer for the National Post (@markmasters), to give us some of the highlights of the discussion. Make sure if you’re a CFL fan on Twitter you follow Mark, as he always has great scoops and information on the CFL. In attendance for today’s call were Vice-President George Chayka, Head Coach and GM Wally Buono, and President & CEO Dennis Skulsky. George Chayka: Empire Field construction should be completed in six weeks (June 15). George Chayka: New season ticket sales are 50% ahead of where they were last year. Wally Buono: Last year was not the kind of team we had in past; it was important to address changes. Wally Buono: Casey Printers is in the prime of his development & growth as a QB. Wally Buono: Two biggest signings are Keron Williams & Davis Sanchez from Montreal. Sanchez helps change the defensive philosophy. Wally Buono: Re: draft – Watkins & Gore are good enough that we will wait; hopefully not more than 6-12 months. Wally Buono: Hamid Mahmoudi like a young Davis Sanchez. Joash Gesse is like a young Javier Glatt. Wally Buono: Joash Gesse would have been 1st round pick in CFL draft if not for injury. Dennis Skulsky: Moving training camp to Kamloops will help tap into fans outside Vancouver; stresses ‘BC’ in BC Lions. Dennis Skulsky: We want to be the biggest thing that happens in the City of Kamloops this summer. Wally Buono: Printers & Chapdelaine have a ‘tremendous chemistry of trust’. Wally Buono: His decision to extend contract in BC was twofold (1) He wants another Grey Cup (2) He still enjoys coaching. Wally Buono: This year’s team must be more physical & play better under pressure. Wally Buono: The Lions are still on the lookout for an established left tackle.